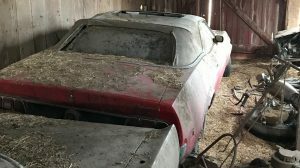 Our Barn Finds community is a fantastic group of people that keep us aware of some amazing cars that are lurking out there just waiting to be written about. 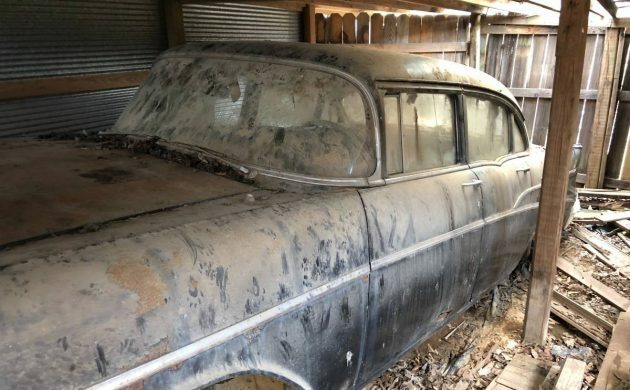 Barn Finds reader Jerry Kenney referred this one to us, and it alone defines what a Barn Find is. Especially as at the time of writing it is still in the barn. 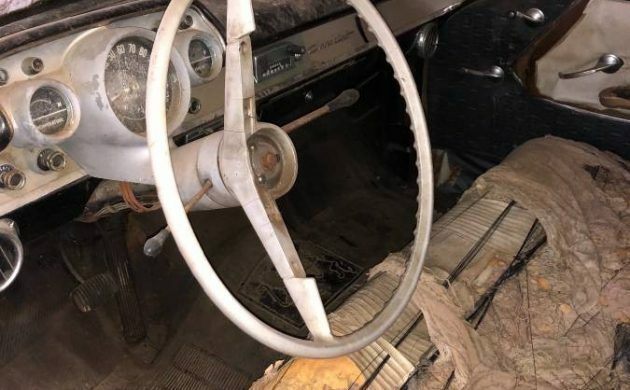 Located in Searcy, Arkansas is this 1957 Chevrolet. Listed for sale here on Craigslist, the seller is asking $3,999. The down side is that the car has no title, but they will provide a Bill of Sale. I guess the first thing that I should address is that this old Chevy is a 4 door, not the more desirable 2 door. 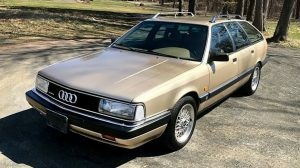 However, if you are a person with a young family that you will eventually be getting in and out of your project car, then maybe this one makes sense. I’m under no illusions with this car, there is a long list of work required before it can grace the streets again. The body looks to be in surprisingly good order given the fact that it has been in extended hibernation. The black paintwork is not original but is an old (and not terribly good) respray. Judging by the paintwork inside the door frames, it appears that this old girl started life finished in Tropical Turquoise. What I’d really love to know is what state the frame is in. If the frame is solid then the basis is there for a viable project. I’ll be kind here by stating that the interior is going to need a bit of work. The dash appears to be complete and in reasonably good condition. Likewise, the one visible door card appears to be structurally sound, so would be a good basis for reupholstering. 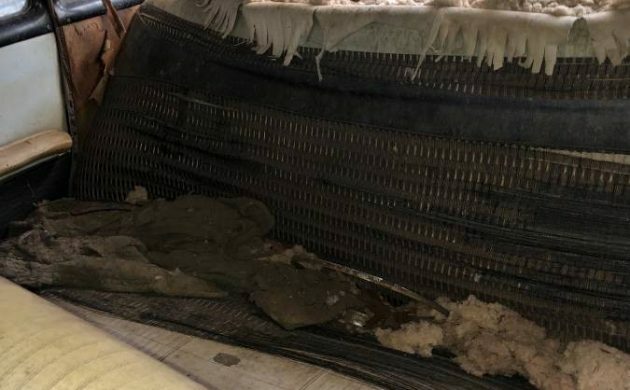 The roof liner appears to be trashed, and as for the seat, I think that a picture is worth a thousand words. This shot shows that there appears to be an intact door card on the back door, so that’s a plus. Looking at the rest of the interior leads me to only one conclusion: You are going to be on a first name basis with your upholsterer. Under the hood is what appears to be the 235ci Blue Flame inline six, which is backed by a manual transmission. Let’s be honest here. I suspect that this is going to need some work. What is really interesting is that this old Chevy has been fitted with air con. 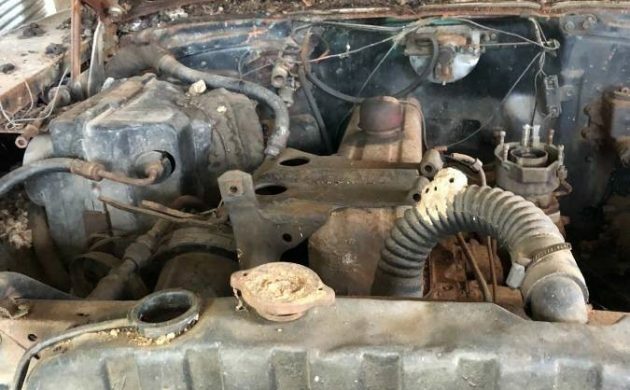 The seller states that he thinks that he can see some power steering components in this photo, but I’m more inclined to think that what I can see is the air con compressor. Whether or not this is a viable proposition really depends on a number of unknowns. The main one is whether the frame is sound. You would need to confirm that before you even considered what path you may want to take with it. 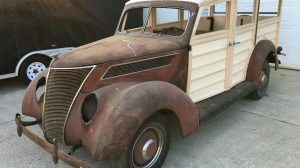 Even if the frame is in good condition this project would consume a lot of time, and probably a lot of money as well. I honestly hope that someone does buy it and bring it back to life. 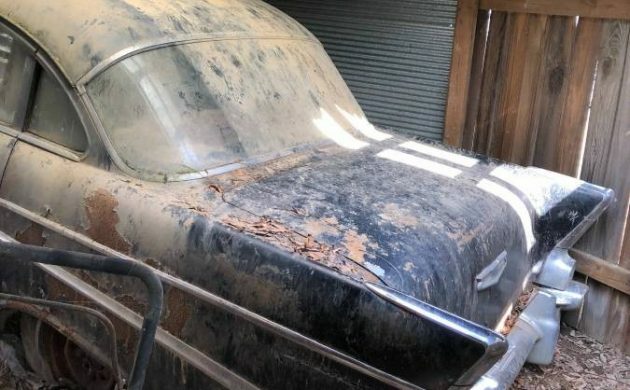 It’s cars like that define what Barn Finds is all about. Sorry, I’m not sure what’s so amazing about this one. Nothing, it’s just ANOTHER ’57 Chev. Amazes me how people want money for a old car but are too lazy to air up the tires then hook a chain to it and pull it out in to the open clean it up some then take pictures. I wouldn’t buy from these people even if I desperately wanted the car. @Jimmy – Preachin’ to the choir, friend. The Craigslist ad says this is an automatic, and I don’t see a clutch. A six banger with factory air? Didn’t think there was such an animal back then. It is an A/C car. You can see that by the pictures of the dash, toward the bottom are the air vents. Im guessing the empty bracket on top of the engine would have been where the ac compressor should be? It does look like a power steering cooler at the bottom of the radiator. In the CL post, I think I’m seeing steering arms/tie rods laying in front of the radiator below the slam panel. Odd place for those to be randomly tossed. Looks like the rear springs have given up to the tin worm too. I bet in it’s day, the proud owner (of an air conditioned turquoise poor man’s Bel Air) painted it black to give the illusion of wealth. My father owned a 56 and a 58 Chevy in black during his salad days. Searcy, Arkansas? Do I hear banjos playing in the background? Pretty basic four door sedan. 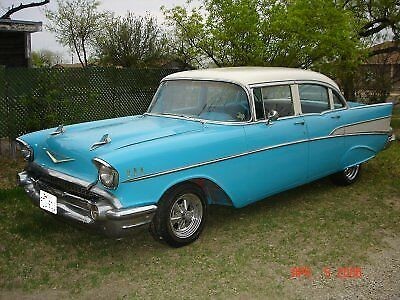 Could still be a fun car to cruise around in – I wouldn’t mind having a six cylinder ’57 for a daily driver during the spring/summer/fall. Four doors are cool and practical, and if you want to drive a car a lot gas mileage matters more than horsepower. This one will need a lot of work. Hard to tell much about it from the pics provided. Parts are readily available. If the body and frame are solid, then it won’t be too bad. I would bring a cash offer of less than half the asking price. Anything more than that and you are better off buying one that is already done, or at least partially done. I have a friend who has a beautiful red ’57 four-door with Factory A/C & 3-speed on the column for sale. I found it for him in Alabama for his wife’s 50th Birthday. It is garage-kept. They drove it for the first five years but I guess the luster wore off and it’s only driven occasionally. Located in Salisbury, North Carolina. Let me know. I need to tell him to advertise here! At least it lives up to the name of this site. Condenser in front of the rad, evaporator on the firewall, so it has A/C components throughout including dash vents. Factory? Real experts would have to demonstrate if that was possible. All that said, this is a parts car and nothing more, only to fantasy buyers would there be any reason to treat it otherwise. Real buyers might be interested in the A/C system if it’s legit and transfer the parts to a body style with more value. Just too many better examples out there for a basic use deal. So curiosity got the better of me and did a bit more research. Though the pics are a bit poor, this appears to be an A/C system that at least resembles if not is in fact a factory or dealer installed, with factory parts, A/C. 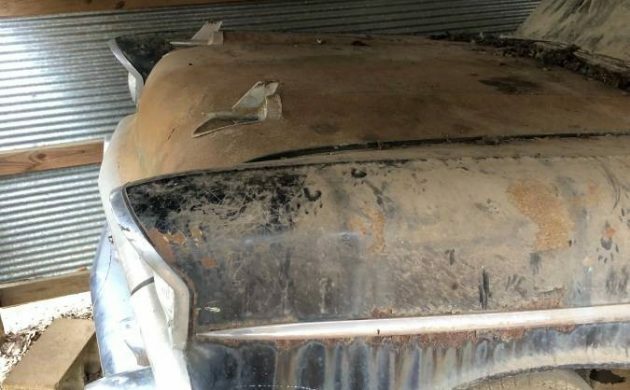 That doesn’t necessarily mean that it makes this particular car more valuable for restoration however. VIN numbers in that time didn’t decode for accessories, so it would take some meaningful documentation (not touted in ad) to prove it was original to the car. 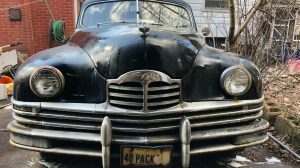 As a donor for a better car, if all the system parts are intact, including the under dash components that are said to be particularly difficult to acquire, then the right buyer might pay a tidy sum for the factory A/C stuff alone. Any of you ever seen a 4 door hard bellair. They bring the cool factor to any four door car. I saw one about 5 years ago and was impressed at how good it looked. I think if this were a hard top it would be a game changer. As it sits though it just another rust bucket.